Dear tourists are glad to welcome you in Georgia! Home » Blog » Dear tourists are glad to welcome you in Georgia! Dear tourists are glad to welcome you in Georgia! The best way to discover our country – this is a journey by car. Ancient Adjure with a subtropical climate. Marvelous black sea coastline with the famous resorts: Batumi, Poti, Gagra. 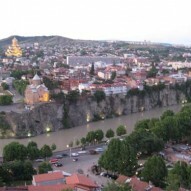 Beautiful modern city of Kutaisi and Tbilisi. Splendid mountain scenery, serpentine of roads, the ice caps of the Caucasus. Serpentine. Georgia – European civilization in the East part of the Europe. Here you can rent any brand of car. You can do this in any major city in the country. You can drive a car yourself; you can hire a car with a professional driver who is well aware of local roads. All cars – representatives of well-known world brands. The quality of the roads of Georgia corresponds to the best world standards. As a souvenir, together with a rental car, you will be given a map of the roads of our country. You can rent a car not yet arrived in Georgia. Any interesting you information on this subject is available on the various special Internet sites. Here you can find phones and companies give in rent of cars, the terms of this transaction. For regular tourists discounts are provided. In addition, for tourists, rent cars, book places in the hotels of their choice. On the territory of the hotel or in close proximity there are comfortable Parking lot and various kinds of services. Come to Georgia. Rent a cars. The only way you can really get to know this ancient region, love hospitable people Gray-haired Caucasus. You will see the unforgettable impressions, beautiful scenery, this comfortable rest, mountain and water sports. Georgia is a Mecca for extreme and ethnographers. For your convenience, we accept payments for the rent of a car in any currency, using Bank credit cards or by Bank transfer. Also you can order together with renting a vehicle other kinds of service or request a tourist routes across Georgia. მანქანების გაქირავება ქუთაისში “Rent a car Georgia”-საგან.